When you think of Dragon Ball Z villains, one in particular probably comes to mind: Frieza. So bringing him back in the latest big screen feature, Dragon Ball Z: Resurrection ‘F’, seems like a natural idea. Dragon Ball Z: Resurrection ‘F’ picks up the story sometime in the three years after Dragon Ball Z: Battle of Gods. One of Frieza’s soldiers collects Earth’s dragon balls and uses them to resurrect the intergalactic warlord. Then, while recovering in space Frieza trains and rebuilds his army for an attack on Earth to kill the two responsible for his defeat: Trunks and Goku. Of course, there is just one little problem with that: Trunks has long since returned to the future and Goku (along with Vegeta) is off training on another planet and is largely out of contact. Thus the remaining Z warriors must battle against Frieza and his army in the hope that Goku will somehow arrive in time to defeat the alien monster. Perhaps the strongest point of Resurrection ‘F’ is its choice of villain. Frieza is a well-known and developed character. If the film would have had a new villain, most of the movie’s runtime would have had to been spent establishing the main villain as a threat and fleshing out his or her backstory. With Frieza, there is no need. If you know anything at all about Dragon Ball Z, you likely know who Frieza is and why he would want revenge on Goku. This in turn allows the film to spend its time on other things—like introducing one of Dragon Ball creator Akira Toriyama’s other creations: Jaco the Galactic Patrolman. Back in 2013, Toriyama wrote a short, 11-chapter manga called Jaco the Galactic Patrolman. Set 10 years before the start of Dragon Ball, the story follows Jaco as he crashes on Earth while hunting for the Saiyan sent to destroy the planet. Over the course of his adventures, he meets 5-year-old Bulma who repairs his ship. In Resurrection ‘F’, it is Jaco who, after learning of Frieza’s return, comes to warn his old friend and get her to contact Goku—and later stays to help protect the Earth (at Bulma’s cajoling). 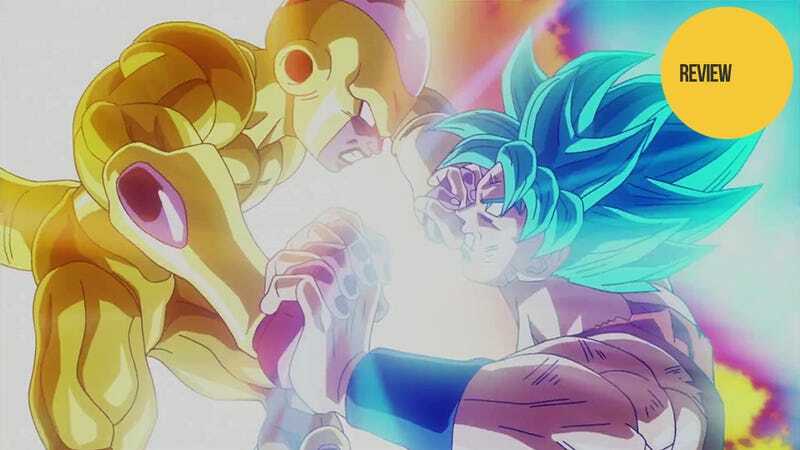 He is a welcome addition to the cast of the film, and it’s great to see how someone who can’t fly or shoot energy bolts from his hands can still go toe to toe with Frieza’s men. In fact, it is not Goku versus Frieza that is the highlight of the film; rather it’s the battle between Frieza’s army and Gohan, Piccolo, Tien, Krillin, Master Roshi, and Jaco. In a good ten minutes of solid action, the small group fights across various kinds of terrain—using their brains as much as brawn against the overwhelming force. But more than that, it is a scene with some of the best animated fight choreography ever to show up on the silver screen—far from the repeated patterns of blurry punches made famous by DBZ on TV. There is more than a fair share of CG used in Resurrection ‘F’. And unfortunately, it tends to stick out like a sore thumb. It’s distracting in many shots, especially those with random mooks floating in the background. However, while still obvious in the more climactic moments of Goku and Frieza’s final battle, the skill of the cinematography overshadows the questionable quality of the CG. Another shortcoming of the film is its decision to include not only one, but two new transformations for Goku—i.e., “Saiyan Beyond God” and (I sigh as I type this) “Super Saiyan God Super Saiyan.” In the series, new transformations were something rare—over the course of 291 episodes, only three major transformations were introduced. Now, we have had two in as many movies. It tends to rob much of what makes the transformations so special if they are thrown at us so readily. And also, let me just say, the blue hair does look pretty stupid. However, the biggest flaw in Resurrection ‘F’ isn’t the aesthetics, it’s how Frieza is handled. Earlier in this review I said that using him as the villain for the film was one of its strongest points. However, it is how he is used that is the problem. While showing himself to be far stronger than Gohan, Frieza is never a real threat to Goku, even in his Golden Frieza form. He certainly gets his hits in, but Frieza never dominates in the fight through his own power. It’s only by outside interference that Frieza ever manages to gain the upper hand—and even then an equally powerful and completely fresh Vegeta is waiting on the sidelines to finish off the battered and bruised foe. All this in turn makes Frieza a weak villain. If the villain is clearly not as strong as the hero, the hero is, therefore, in no danger of losing. If there is no danger, there is no tension—and without tension, it can be nearly impossible to get into the drama of the action. And then there is the ending. The other reason it’s hard to get lost in the climatic battle of Resurrection ‘F’ is the obvious deus ex machina laid out in the film’s first few minutes—i.e., when Whis explains that he has the power to rewind time. Thus, even when Frieza does manage to get the upper hand, there is no tension with such an obvious way out looming in the wings. Dragon Ball Z: Resurrection ‘F’ is an enjoyable enough movie but also a deeply flawed one. While the first half of the film is filled with great action, comedy, and a fun new character, the film loses its momentum once the main battle begins and tension all but disappears. So while there is some fun to be had, Resurrection ‘F’ is far from the grand return Dragon Ball Z’s most iconic villain deserved. Dragon Ball Z: Resurrection ‘F’ began airing in Japanese theaters on April 18, 2015. It is currently scheduled for a US release this summer.